Mclain Ward and HH Azur. Photos by The Book, LLC. North Salem, NY – May 10, 2015 – The first week of competition at the Old Salem Farm Spring Horse Shows wrapped on Sunday with Mclain Ward and Double H Farm’s HH Azur besting 39 contenders in the $50,000 Old Salem Farm Grand Prix, presented by The Kincade Group. Also highlighting the final day of competition, Victoria Colvin and Ovation scored the Grand Junior Hunter Championship for the first time in Colvin’s career at Old Salem Farm. The Old Salem Farm Spring Horse Shows run May 5-10 and May 12-17 at the picturesque Old Salem Farm in North Salem, NY. The shows feature over 130 hunter and jumper classes each week, bringing together top competitors, including Olympic show jumpers, from all corners of the country to compete for more than $500,000 in prize money. The jump-off was not yet in Mclain Ward’s future as he entered the ring to bat cleanup in the afternoon’s featured class, but HH Azur had plans to change that. Clean, smooth and within the time allowed, the nine-year-old Belgian Warmblood mare carried Ward to the jump-off where they again returned last and scored the double-clear win in 34.096 seconds. Georgina Bloomberg was second aboard Caleno 3 for Gotham Enterprizes, LLC in 34.365 seconds after giving the impressive crowd that lined The Grand Prix Field their third clear of the day in the original order. Third fell to Peter Leone and My Pleasure, LLC’s My Pleasure who jumped first in both rounds and crossed the jump-off timers clear in 34.730 seconds. Leslie Howard and Martin Guerra’s Balboa 6 were fourth after securing a jump-off in the first round and finished with the fastest four-fault trip of the day in 37.051 seconds. Howard also piloted Genrille Van Spiedveld for GJ Stables & Peter Howard, marking her return to the grand prix on multiple mounts after undergoing hip surgery this winter. Ward actually sat on Azur as a five-year-old and decided not to buy the mare, but the opportunity came again at the end of last year. Ward jumped at the prospect and just several months later, he is confident the horse is destined for greatness. “I think this horse could win the Olympic Games,” he said. Next week, HH Azur will return to The Grand Prix Field with Ward in the irons and again challenge the big money in the $100,000 Empire State Grand Prix, presented by The Kincade Group. Ward’s win tightened his grasp on the $20,000 Leading Jumper Rider Challenge, which he has led all week. Click to watch a video interview with Mclain Ward. Before the grand prix took the stage, junior and amateur riders closed out their jumper classics for the week with Victoria Colvin and Take The High Road, LLC’s Don Juan winning the $7,500 Medium Classic, presented by Town Vibe Media. Lucy Deslauriers and Lisa Deslauriers’ Hester jumped to top spot in the $15,000 High Classic, presented by Miller Motorcars. Victoria Colvin of Loxahatchee, FL added to her list of incredible junior career accolades as she swept the Small and Large Junior Hunter 16-17 divisions, won the Grand Junior Hunter Championship, and was named Best Junior Rider on a Horse. She had success at every discipline this week, having won the Equitation Challenge, presented by EquiFit, and the Medium Junior/Amateur-Owner Jumper Classic. “Every horse I did this week has been really great,” she said. In the Large Junior Hunter 16-17 division, she and Dr. Betsee Parker’s Ovation won two and placed second in two over fences classes. They also took the blue ribbon in the under saddle class, which gave them the division championship and the Grand Junior Hunter Championship. She was reserve champion in the division on Parker’s Canadian Blue, winning first, first, and second over fences and third under saddle. 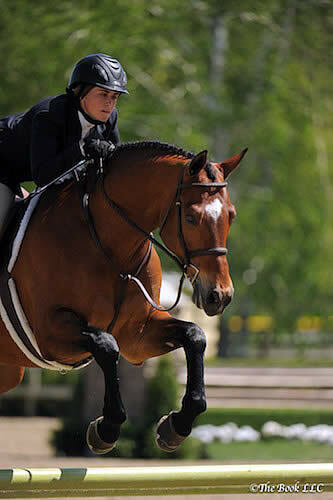 In her last year as a junior rider, Colvin is preserving bittersweet memories of riding her junior hunters. It is planned for Ovation to retire at the end of the year as one of the winningest junior hunters in history. In the Small Junior 16-17 Hunter division, she was champion on two more Parker-owned rides, Small Affair and Way Cool. Small Affair placed first and second over fences and second in the under saddle for the championship, while Way Cool was reserve champion after placing first and second over fences. Colvin’s hunters will take next week off before contesting the Devon Horse Show, “so they’ll be fresh and happy”. In the Small Junior 15 & Under Hunters, Akinda and Coco Fath, riding for Hillside Farm, Inc., were champions. They were first, first, second, fourth, and fifth. Lilli Hymowitz and Rose Hill Farm’s Enjoy were reserve champions with first, first, second, and fourth place ribbons. Boneparte Z and Ellie Ferrigno, riding for Kristi C. Siam, took the championship in the Large Junior Hunter 15 & Under Hunters. They won three classes and placed third in the remaining over fences class. The reserve championship went to Cassanto and Emily Perez, who were first, second, third, and sixth over fences and won the under saddle. The Old Salem Farm Spring Horse Shows continue on May 12-17 with another week of exciting competition, including Saturday’s $20,000 Speed Derby of North Salem and $10,000 USHJA International Hunter Derby as well as the $100,000 Empire State Grand Prix presented by The Kincade Group on Sunday.